Is 'Venom' Really That Awful? I Answer 10 of Your Burning Questions! Tom Hardy plays a vicious Marvel comic book character. Bradley Cooper plays a washed-up country star singing the blues. A year ago, only one of these two lead performances seemed like a sure bet for box office and critical success. 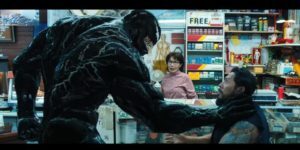 Then came the twist: While A Star is Born is on the edge of glory, Venom appears snake-bitten with awful reviews. Is the bad buzz justified? I have all your answers. You’re welcome. 1. Let’s get to it: Is Venom fun-bad or just bad-bad? Mostly bad-bad, with a splash and dash of fun. Nearly four years after Deadpool, comic-book flicks are still trying to recapture that hit’s naughty sense of humor and style. Consider this a watered-down PG-13 wannabe. The title character is an alien species that bites off heads and munches on brains. It lands on Earth with intent to destroy. But it needs a human host to survive. Enter Tom Hardy’s good-guy TV reporter Eddie Brock. He’s just lost his job, his girl, his apartment, his life. He doesn’t deserve an alien takeover. This concept may seem vicious —remember the movie Alien? — but the symbiotic relationship is oddly and mostly played for crude laughs. 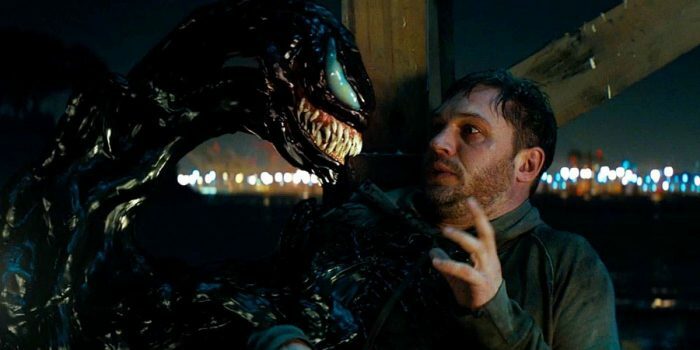 Weirdly, Venom talks to Hardy in a deep voice that sounds like an evil caricature from a 1980s TV cartoon series. 2. I’m already confused. Is this story as convoluted as you make it sound? If anything, the story could use a fast forward button. Venom doesn’t even show his ugly, sharp-toothed face until nearly an hour into movie. Instead, we get 45 minutes of Brock’s pathetic daily life, including a tussle with a loud neighbor and fights with his girlfriend (Michelle Williams). We don’t need to know every mundane detail of a hero’s origin story — and this guy isn’t even a hero. Get to the good stuff already! 3. So Venom is the villain? Ah, no. That would be Carlton Drake (Riz Ahmed), playing a billionaire entrepreneur scientist who may have figured out the cure to pancreatic cancer but also loves to mesh aliens with humans in his spare time. Ahmed, the Emmy winner for the incredible the HBO miniseries The Night Of and the actor who played Hannah’s baby-baddy in Girls, adds little to the thankless role and is as intimidating as a Hershey’s Kiss. 4. But the action and special effects must be kinda cool, right? Green screen city, baby! The alien gunk that invades human bodies was obviously made on a computer screen. The action, directed by Ruben Fleischer (Gangster Squad), is repetitive and set mostly in pitch-black downtown San Francisco. Though a chase scene on motorcycles does the job. 5. I don’t care about any of this. Do I see it for Tom Hardy or no? The enigmatic Oscar nominee is notorious for the intensity that he brings to his diverse roles. Think The Dark Knight Rises,The Revenant, Mad Max: Fury Road, even Dunkirk. He does give it his all in Venom — and his commitment is the biggest selling point. He’s not at all credible as a successful investigative TV reporter but is as a mumbling loser. I don’t want to know what kind of accent Hardy is attempting here, and I don’t care. 6. Aren’t Marvel movies supposed to be amazing? Hello, Black Panther and Avengers! Ahem, Venom is an entry in the Marvel Universe — not the Marvel Cinematic Universe. There is a difference. The opening credits make it clear that this was made only “in association” with Marvel. There is a difference. That said, guess who makes the requisite cameo? 7. Yeah, you skipped past the most head-scratching part. Michelle Williams is in this cast?! Already repressed it. The talented actress slums it by playing Hardy’s beleaguered, heels-wearing girlfriend. She looks utterly lost and has little to do aside from yelling at her man. This is a paycheck part, end of story. 8. Fine. Uncle. At least I can bring the kids? Babysitting ain’t cheap. I guess? Though Venom is a carnivore to the highest degree, there will not be blood. He’s also not as terrorizing as the way that Topher Grace memorably played him back in 2007’s Spider-Man 3. But he does have a potty mouth — I heard a few curse words and he does call Hardy a “p—y.” (This got a big laugh from the audience in my screening.) Some of the pop culture references will be completely lost on the youth: Two jokes name-drop two different films released in 1982. 9. Is this better or worse than the bombastic Fantastic Four remake from a few years ago? Slightly better. It certainly seemed shorter! Yay for that. 10. Will there be a sequel? The set-up is in place, sigh. Any ideas on how we can get Lady Gaga to contribute a few ballads to it? « ‘The Hate U Give’ Is A Powerful Must-See Drama: Read the Early Review!